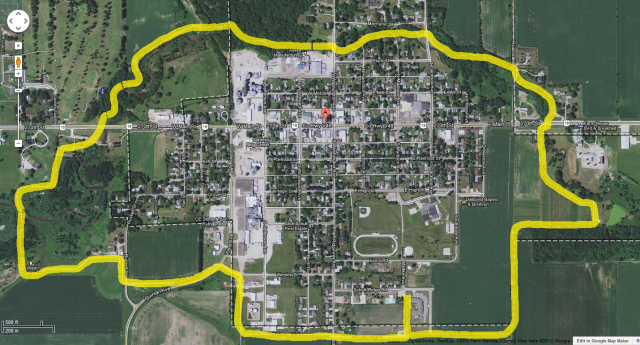 Below is an aerial view of Fredericksburg with the Plum Creek Bike & Natural Trail highlighted in yellow. We will begin our Trail journey at the Robert Mattke Park on the west edge of Fredericksburg. From the west end, the trail heads north under the Hwy 18 bridge and winds along Plum Creek to the east into town. You will wind along corn/bean fields along the creek and into a wooded area, which is also along the creek. The Trail will cross North Washington Avenue and you will then be entering City Park on the north end of town. The City Park gives you a place to sit and relax in the shade of all of the big, old Maple trees. There is also a place for the kids to play here, while taking a break. From the City Park, you will cross Jackson Avenue to another wooded area. This takes you to Glenwood Lane thru the tall, shimmering pine trees. After the walk through the pine trees, you will cross the black top road and head towards Prestein Park. There is parking available here with access to the trail. Next you cross the Trail underneath the east Hwy 18 bridge. From there you will see the Old Country School House (District No 1. - 1854). Continue on your way through the Vineyard east of town and the cornfield. You can head back to town by the Meinerz Dairyland Swimming Pool or continue on through the cornfield and cross South Washington Avenue. You continue through the fields and eventually cross the black top on the west edge of town. Heading west yet you'll encounter Pioneer Cemetery and will wind through the field and end back at Mattke Park. The trail offers you over 5 miles of scenic biking and/or walking. Of this, half is black topped. The rest of the trail is a bed of crushed rock. We hope you will enjoy your journey on the Plum Creek Bike & Nature Trail.